Sunrise over Hayward Field marked a few hours until the start of the second day of the U.S. Trials. But by the time the sun set, three more HepsNation athletes book their spots in their event finals that will be held on Monday. The women’s 10K final was one of the first running events to take the track with the hopes of providing a more ‘comfortable’ temperature for the athletes— a schedule that will stand in Rio to avoid racing in extreme heat. Liz Costello (Princeton ’10) settled into the race pack fairly early in the 25-lap race. At 3200m Costello was still in the mix running among the cluster of 16 women who followed Molly Huddle’s lead. Around 7200m there was a shift in pace and the front runners opened a 50m gap between the rest of the field, which only continued to grow. Costello finished sixth in 32:31.81 and Courtney Smith (Harvard ’18) ran 35:45.82. This was Smith’s first race since early April when she qualified for the Trials at the Payton Jordan Invitational. The semi-final heats of the women’s 800m were run strategically among the mixed group of veteran and young qualifiers. Kate Grace (Yale ’11) made her move with just 200m left in the race to position herself in fourth. On the homestretch, Grace swung out wide to chase down the lead runners and claim second in her heat with a strong finish in 2:00.94. She is the sixth fastest qualifier going into the final on Monday. Cecilia Barowski (Princeton ’16) fell short of her season PR running 2:08.36. Adam Bragg (Princeton ’16) had an easy clearance during his first attempt at opening height of 5.40m (17-08 1/2) in the men’s pole vault. He was unable to get over 5.50m (18-00 1/2) to secure a spot in the next round of competition. In the first qualifying round of the women’s 100m, Gabrielle Thomas (Harvard ’19) ran 11.35 to finish seventh in her heat. The time was just 0.05 shy of her 11.30 lifetime best. Thomas will race again in the 200m qualifying round next Friday. 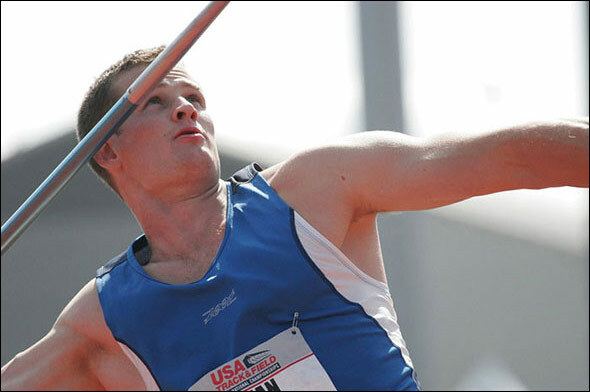 Sean Furey (Dartmouth ’04) and Rob Robbins (Cornell ’16) recorded two of the furthest throws in their flight to qualify for the next round of the men’s javelin. Furey threw 76.26m (250-02) on his first attempt and decided to pass his two remaining throws. He currently sits at second in the field. Robbins struggled with his first throw of 63.68m (208-11). His 72.43m (237-07) second throw proved to be his best and moved him to seventh going into the finals that will be held on Monday. This entry was posted on Saturday, July 2nd, 2016 at 8:00 pm. It is filed under Olympics, Spotlight. You can follow any responses to this entry through the RSS 2.0 feed.